We had a great time getting to talk to students about TFND at the University of Mary Community Fair. TFND had a great time participating in the Community Block Party in Jamestown last week! Tobacco was the first cash crop grown in North America starting in 1612. Since then, mass amounts of money have gone towards both selling tobacco and preventing its use. Studio One is a live television show produced by the University of North Dakota’s Television Center. The Television Center offers an extensive internship program through Studio One. An internship with Studio One provides valuable on-the-job experience, a chance to make professional contacts and the opportunity to work on an award winning project. Visit studio1.und.edu for more information. Tobacco Prevention Coordinator at Grand Forks Public Health, Kailee Dvorak, is here to tell us why prevention and control of tobacco is so important. Grand Forks has been putting time and money into the prevention of tobacco use, and Tobacco Prevention Coordinator Kailee Dvorak says that laws have been passed to help this effort. “Breathe ND, or the Center for Tobacco Prevention and Control Policy, was formed after an initiated measure back in 2008. It was called Measure 3 back then. The voters of North Dakota passed that measure, and by law it formed the Center for Tobacco Prevention and Control Policy, which states that tobacco settlement dollars, specifically the strategic contribution funds, so a portion of the tobacco settlement dollars that come into the state of North Dakota, are spent on tobacco prevention and control,” said Dvorak. The Campaign for Tobacco-Free Kids says North Dakota is the only state that is spending enough money on tobacco prevention. Dvorak says that they are also doing things locally to continue to make progress. “Here in Grand Forks we receive funds from the center (Breathe ND) to work locally on tobacco prevention and control policy in accordance to CDC best practices,” says Dvorak. There are many schools involved with trying to prevent their students from using tobacco. UND is one school that takes tobacco use very seriously. “The funding that we utilize locally we’ve also been able to partner with UND, so that tobacco prevention policy efforts can happen on campus,” said Dvorak. There have been studies done to show how much progress has been made in tobacco prevention in North Dakota. “From 2009-2015, smoking among North Dakota’s high school students fell by 48%,” said Dvorak. There was also a study that showed the mean level of indoor air pollution in Grand Forks went down by 92% after the law was passed. Dvorak and her co-workers work every day to help the community fight the tobacco industry. They take their goals very seriously in an effort to keep young people away from tobacco. “One of our main goals is preventing youth initiation and also decreasing tobacco use rates across the board and changing that social norm,” said Dvorak. One thing that some people might not know is these efforts aren’t funded by the community. “We aren’t funded by taxpayers,” said Dvorak. The efforts are funded by tobacco settlement dollars. The e-cigarette industry is already worth billions of dollars, but there is nowhere near as much information on e-cigarettes as tobacco products. This should raise alarms, as the tobacco industry lived under a veil of scientific obscurity for decades until the detrimental health effects of cigarettes became well-known. Many people think e-cigarettes are a safer alternative, but that belief remains scientifically unproven, and evidence continues to come out saying e-cigarettes have toxic effects. E-cigarettes are just as addictive as smoking tobacco. E-cigarettes and tobacco products have the same highly addictive drug: nicotine. E-cigarettes derive nicotine from traditional cigarettes, delivering the same drug in a smokeless (vapor) form. In July, Daily Mail reported on a study by the American University of Beirut and the Center for the Study of Tobacco Products which demonstrated e-cigarettes contained highly addictive forms of nicotine. E-cigarettes might not have the same carcinogenic materials as cigarettes (like tar), but its nicotine still fosters addiction. A supposed benefit of e-cigarettes is inhaling vapor instead of smoke. However, e-cigarette vapor is turning out to have a destructive effect on lungs. A recent July analysis by the University of Athens claimed that “using an e-cigarette caused an instant increase in airway resistance that lasted for 10 minutes.” Put simply, smoking e-cigarettes unhealthily constrains your airways. Additionally, a study published in May by Indiana University showed that even nicotine-free e-cigarette vapor had damaging effects on the endothelial cells of the lungs. Endothelial cells protect the lungs from infections, so damaging them can’t be good for your immune system. Another study, conducted this August by the University of Southern California, found that teenagers who try e-cigarettes are more likely to smoke tobacco. The researchers sampled 2,500 9th graders who had never had smoked a cigarette, finding those who tried vaping e-cigarettes were 23 percent more likely to smoke a tobacco cigarette over those who had never tried an e-cig. On top of that, one-fourth of the surveyed youth who tried e-cigarettes admitted to smoking tobacco cigarettes within the last 6 months. Newswise — While the character Don Draper in the television show Mad Men looked for a way to first save his cigarette advertising accounts, and then to distance himself from them, a new book—“Tobacco Goes to College”—shows the power of advertising impacted would-be-smokers long before the Mad Men era. Elizabeth Crisp Crawford, associate professor in the Department of Communication at North Dakota State University, Fargo, studied how tobacco advertising from 1920 to 1980 targeted college students. 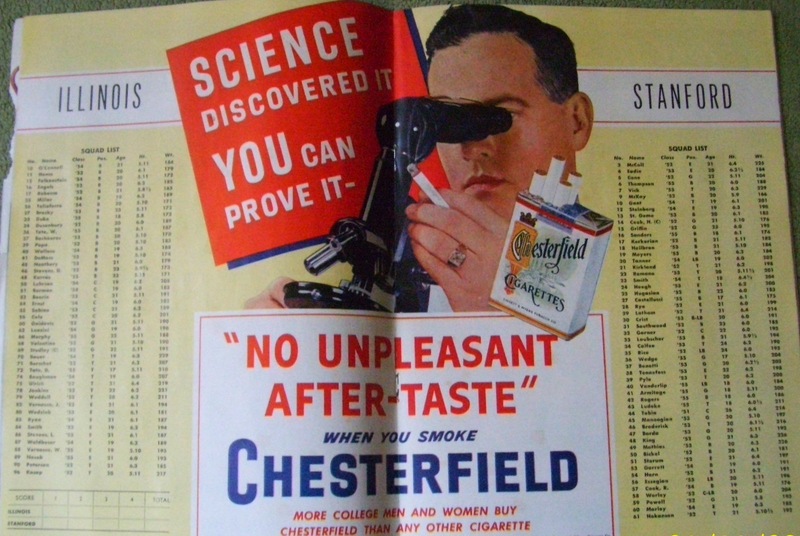 In her research for “Tobacco Goes to College: Cigarette Advertising in Student Media, 1920-1980,” Crawford found the advertising plans and creative tactics to be extremely strategic over the six decades studied. Social pressure and social appeals hit the mark with potential college consumers. The successful advertising tactics, said Crawford, are still being used today for a variety of products. “I see the industry using many of the same tactics it used 50 years ago with cigarettes—especially the filtered brands. When we discuss the promotion of e-cigarettes, I think that we need to look at the history of tobacco advertising,” said Crawford. Key insights into the target market make these ads successful. Crawford’s book contains an in-depth analysis of vintage cigarette ads. “Jane Wyman – famous Barnard Alumna says: ‘Chesterfields always give me a lift. They’re wonderfully mild and taste so good. They’re my favorite cigarette,’” according to an ad which ran in NDSU’s student newspaper, The Spectrum, on April 7, 1950. Similar ads ran in student newspapers across the country including Smith College, University of Portland, Elon University, and in football programs at colleges, including the University of Tennessee at Knoxville (Crawford’s alma mater), at Chattanooga, and Illinois vs. Stanford. “Tobacco advertisers knew college students’ needs and positioned their product in a way that could help fulfill these needs,” said Crawford. 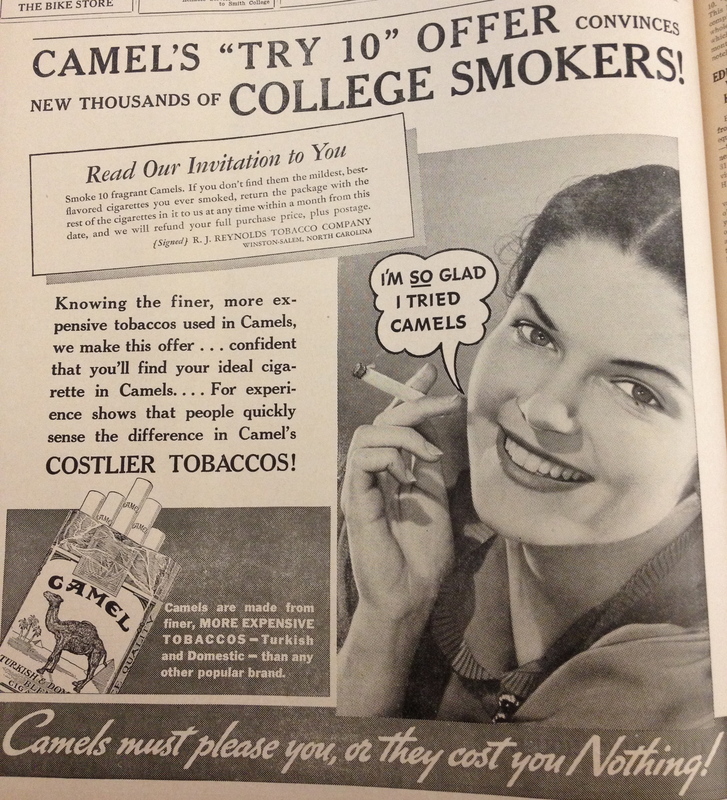 In 1963, the Tobacco Institute pulled tobacco advertising from college publications. Crawford points out that nearly 2,000 publications then looked for ways to recover what amounted to as much as 50 percent of lost revenue from the ads. Crawford’s interest in this particular area of research also has a personal link. “Of my four grandparents, the two that attended college smoked. I found this connection to be interesting,” she said. “Tobacco Goes to College” was named an Outstanding Academic Title by Choice Magazine in 2014. The list comprises about 10 percent of more than 7,000 titles reviewed by Choice each year. According to Choice reviewer N.E. Furlow, “In short, the book offers a detailed inside look at the tobacco industry’s calculating strategy to entice a young population to use its products.” The book is published by McFarland & Company, Inc. Figures show the continued compelling force of advertising. According to a CDC report, tobacco companies spent $9.6 billion marketing cigarettes and smokeless tobacco in the United States alone in 2012. That’s equivalent to more than $1 million every hour, based on $26 million daily. A Federal Trade Commission report shows $9.2 billion spent on cigarette advertising and promotion in 2012. The report notes the expenses include magazine ads, distribution of samples and coupons, retail ads, discounts, retailer payments, rebates and direct-mail advertising. A Gallup-Healthways Well-Being Index showed the national smoking rate at 19.7 percent in 2013, with North Dakota’s smoking rate dropping from 24.1 percent in 2008 to 18.5 percent in 2013. Kaiser Family Foundation data show the national smoking rate at 18.1 percent in 2013 and North Dakota at 21.2 percent. Crawford’s research has been published in Journalism and Mass Communication Educator, Social Marketing Quarterly, and the Journal of Health and Mass Communication. Crawford joined NDSU in 2009. She received a doctorate degree in communication and information from the University of Tennessee, Knoxville, and a master’s degree in advertising and public relations from Marquette University, Milwaukee, Wisconsin.